Since 2016, Wisconsin counties have begun opting into an innovative program called PACE (Property Assessed Clean Energy), which enables property owners to obtain low-cost, long-term loans for energy efficiency, renewable energy, and water conservation improvements. At its most recent meeting on June 16, the Dane County Board of Supervisors approved a resolution authorizing the County to join the program. In so doing, Dane joined 18 other Wisconsin counties that offer this special financing tool to leverage clean energy investments on commercial and industrial properties. Projects financed using PACE can generate positive cash flow upon completion with no up-front, out-of-pocket cost to property owners—eliminating the financial barriers that typically prevent investment in revitalizing aging properties. The term of a PACE Financing may extend up to the useful life of the improvement, which may be as high as 20 years or more, and can result in cost savings that exceed the amount of the PACE Financing. The result is improved business profitability, an increase in property value, and enhanced sustainability. PACE Financing is sourced from an open lending market and secured through a voluntary PACE Special Charge, repaid directly to the lender. Like property taxes, PACE Financings may be transferred to the next property owner if the property is sold. The remaining balance of the PACE Financing is repaid by the subsequent owner, who continues to receive the benefits of the improvements from the project. Eligible commercial properties include multifamily buildings of five units or more, as well as industrial, private nonprofit, agriculture, and hospitality properties. A voluntary initiative, PACE Wisconsin began taking shape last year when three state organizations--Green Tier Legacy Communities, the Counties Association and League of Municipalities-- joined forces to launch a Joint Powers Commission and to recruit counties to enter into the program. Member counties agree to adopt a Model PACE Ordinance when they join the Commission, which authorizes the county to impose a PACE special charge, collect payments for the special charge in installments, place those installments in the tax roll at its discretion, and delegate that authority to the PACE Commission. 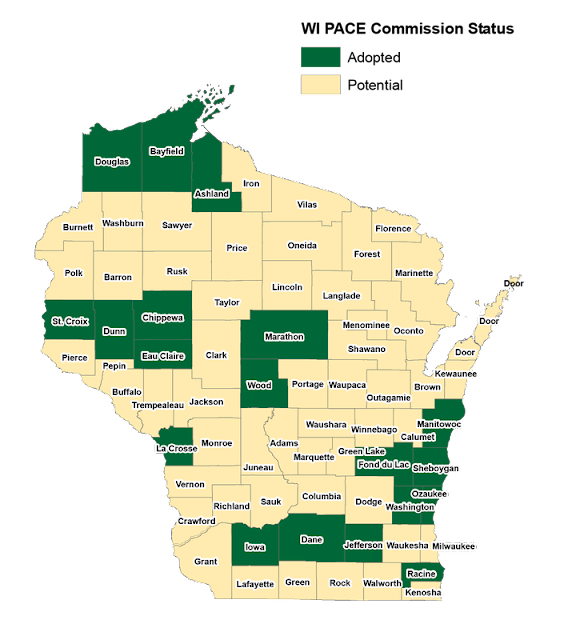 For more information on Wisconsin’s PACE program, including an up-to- date map of participating counties, visit www.pacewi.org.